One of the things you may encounter concerning the electrical work in your home is aluminum wiring. In many cases, it may not be possible for the homeowner to be sure if he has aluminum wiring, since some copper wiring can be coated with aluminum, and some aluminum wiring can be covered with copper. The age of the home is a better indicator: any house built between 1965 and 1970 should be immediately suspected of having aluminum wiring. Sometimes a homeowner can tell if the wiring is aluminum, but it often takes a pro, since aluminum wiring can be coated with copper. During the Vietnam War, when copper became very scarce, homebuilders were given the option of using aluminum wiring. Aluminum is an excellent conductor and performs well under a variety of circumstances. The problem was that no one followed through with the builders to ensure they were using outlets and switches which were approved for aluminum wiring usage. Aluminum wiring has to be one gauge thicker than copper wiring for the same application. The problem is the junctions, such as at outlets and switches. Since aluminum is soft, which it heats up (such as when you use a hair dryer or heating pad), it expands. When it cools, it contracts. Because there is such a difference, it leaves a tiny bit of space when it contracts again unless the connection is made for aluminum wiring. 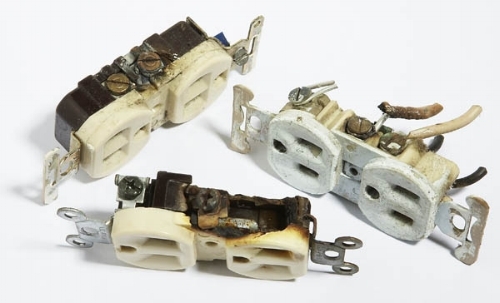 This constant expansion and contraction will loosen both the receptacle and the circuit breaker box connections over time. Loose connections create arcing, which creates a fire hazard. In fact, a home with aluminum wiring is fifty-five times as likely to have a wiring fire than other homes. Also, aluminum wire oxidizes over time if it isn’t treated or coupled to a receptacle or outlet marked CO/ALR, which is rated for both copper and aluminum. Another problem is wiring junctions, which aren’t supposed to be uncovered in a home setting, but many homes have them in spite of this rule. If it isn't CO?ALR rated, it isn'tsafe to use with aluminum wiring. If a home has aluminum wiring, it depends on the structure and size as to what the solution may entail. It also depends on the homeowner’s wishes and insurance company requirements. The crucial point which the homeowner who faces an aluminum wiring situation must gather from this post is that the aluminum wiring problem isn’t going to go away on its own, even if it has successfully managed to avoid causing a fire up until this point. As time goes on, it becomes progressively more susceptible to failure.